Four new “ace” audit teams will be monitoring real estate transactions in B.C. and Ontario for money laundering and tax evasion, according to Tuesday’s federal budget. Last year, the CRA found nearly $600 million in unpaid taxes in Ontario and B.C.’s real estate sectors, and levied $47 million in penalties over the same period. In B.C., the CRA auditors found that 54 per cent of the unpaid taxes came from not paying GST, while 45 per cent was from income tax. The government will also give $68.9 million over five years to the RCMP, $28.6 million over four years to build a “Money Laundering Centre of Expertise,” and push $16.9 million into FINTRAC, the country’s money laundering watchdog. FINTRAC will “increase outreach and examinations in the real estate and casino sectors with a focus on the province of British Columbia,” the budget document says. In this province, licensed casinos were part of a transnational scheme that laundered hundreds of millions in cash – likely profits from the deadly fentanyl epidemic. The director of The City Program at SFU, Andy Yan, told CTV News he’s glad that Ottawa is paying attention to what is happening in B.C. 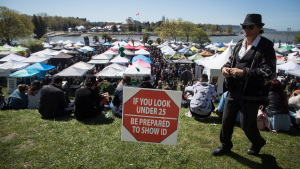 “They are trying to contain what is happening in Vancouver just to Vancouver, rather than have it spread over the rest of the country,” he said. He said the country used to have special audit teams, but they were disbanded. “Maybe we should always have had that sort of institution, just looking at the level of money we’re talking about,” he said. B.C. Finance Minister Carole James said she’s hopeful the federal measures will crack down on crime and also make housing more affordable if criminal cash is stopped before it hits the housing market. “I’m glad to see the province’s biggest crisis, and our focus, housing affordability and dealing with money laundering there. And I’m glad to see the federal government will be joining us at the table,” she said. The provincial government has identified real estate as a sector worth investigating for potential money laundering as well, with a report by former RCMP commissioner Peter German expected at the end of March. The federal government also says it will provide $1 million to Statistics Canada to conduct a comprehensive federal data needs assessment to further streamline data sharing and monitoring of Canadian real estate purchases. The money could mean that the estimated tax revenue could increase, the budget says. Investing some $150 million more in the CRA to boost auditors, track offshore accounts, and keep tabs on cryptocurrencies, could get more than $350 million in additional taxes collected, the budget document says.